The Pusch Ridge Wilderness within the Catalinas near Tucson offers superb jaunts and the Romero Canyon Trail #8 to the Romero Pools makes a spectacular day trip. The Romero Canyon trail is easily accessible from Catalina State Park, offering large parking areas, portable restrooms and a picnic area near the trailhead. 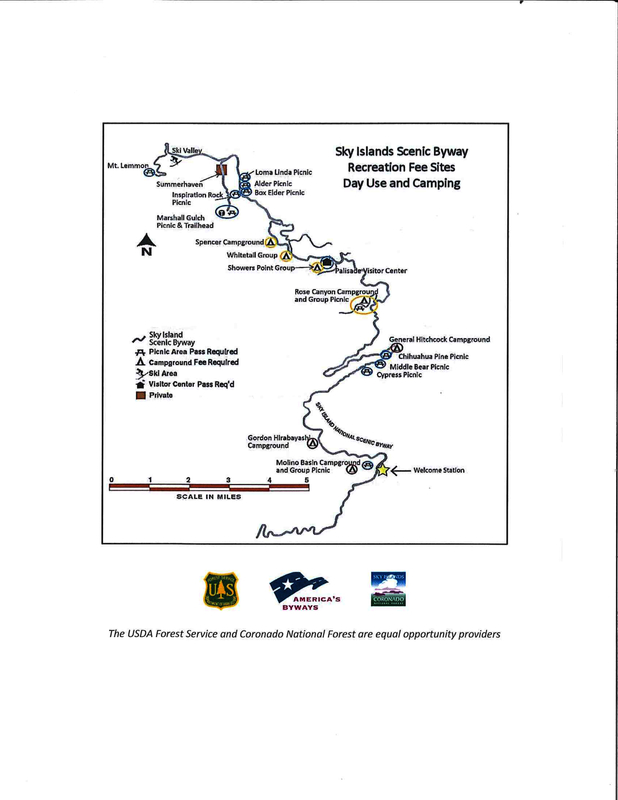 The park entrance fee includes a general trail map of the area. Just follow signs to the parking area. This is a popular and well traveled trail, but for a weekend hike in October, the traffic seemed normal and the company quite friendly. Maybe the fact that it was still hitting the high 80's had something to do with it. The map states that it is 2.3 miles to the pools, so here we go! From the trailhead (which is to the right of the parking lot), head across the streambed and up a small incline until the path flattens out a bit. As you trek through a trail of fairly deep sand , take in the beauty of sonoran desert vegetation as you look ahead to higher elevations, and the pine and juniper covered peaks of Cathedral Rock and Mt. Lemmon. I felt like I was hiking in Phoenix and Flagstaff at the same time. Deja Vu. Follow the posts marking the Romero trail that lead you off to the right and you will begin your climb. After about 1/3 mile, thankfully the trail turns to more solid ground and begins to elevate towards Montrose Canyon. A sign shortly thereafter indicates the entrance to the Bighorn Sheep Management Area. NO DOGS ARE ALLOWED PAST THIS POINT, for obvious reasons, so leave your buddy at home on this trip. Not a good idea to interrupt sheep while they are managing. Clever switchbacks and gradual elevation make this my kind of hike. Being a bit of a rockhound, I noticed this area to be quite rich in quartz, granite and great looking rock formations. As you elevate, pay attention to the trail. Keep an eye out for cairns and watch for dominant switchbacks and you will have no problem staying on the trail. After you top out at somewhat of a saddle at about 1.7 miles, you get great views of Oro Valley behind you (too much construction! ), and the serenity (aaahhhh....) of the wilderness area that lies ahead. It is about 20 minutes to the pools from here. The trail begins to offer more diversity past this point, a variety of short inclines and declines carry you mostly upward towards the inner canyons. Off to the left and far below you can see the stream which connects from the pools that lie above and ahead of you. There is a great shady stop off in a clearing to your right in this area where fire rings indicated I wasn't the only one who thought this was a nice little inlet. When you get close, the trail begins to descend and close in towards some large rock slabs, your instincts will help you spot the pools which are to your left. The trail leads down to the top pool for easiest access. There was no running waters or falls on this dry day, but there was standing water in the pools, which I believe is usually there. As usual, my adventurous spirit and curiosity took the best of me and we decided to negotiate our way towards the lower pool for some solitude. OK, so don't take the short little side trail to the left that puts you on top of some large rock slabs with the lower pool on your right. It's rather like an automatic slip and slide down to the water. And these were dry rocks. My camera took the dive first and in my attempts to rescue my dear friend, I got the trip down the slip and ended up with a small gushing gash that warranted a follow up visit to Urgent Care. Nothing major really, but I totally appreciated my first aid kit and wraps I carry. I left my solid bloody handprint on the rock, hopefully not to be mistaken as an ancient petroglyph or a mysterious murder in the canyon. I found out later (duh) that the trail you come in on crosses the top pool, takes a left upwards and then drops down on a small side trail towards the lower pool. At that pool ,there is a rope tied to the tree over the water, but after the slide ride I wasn't in the mood to test any depths. Now this explains why I didn't get any photos of the areas surrounding the pools or any on the return route for that matter! Hopefully, someone will add some pics from their next trip. A small lovely marsh with wildflowers graces the small pool waterside and there were butterflies all around. Lovely spot for a lunch break. The main trail does continue on past these first set of pools towards Romero Pass if you wish to continue. Check your maps and distances carefully, there are quite a few connecting trails in this system for longer explorations, including to the summit of Mt. Lemmon. On your return trip, follow the same way you came, make sure to PAY ATTENTION as you are elevating back out of the pool area...there are cairns at a switchback that turns directly right (northeast), where there is also a faint trail blocked by a small line of rocks that leads up and off to the left. Make sure you take a RIGHT, as that is the main trail you came in on. I am not sure if that left fork connects later, but it is not the main trail, so stay right. From there, its smooth sailing back to the parking area as you are headed mostly downhill. Enjoy your day and try taking my suggested "scenic drive" route listed below to Catalina State Park to make this a total desert adventure. Have fun and be safe out there! Coronado FS Reports A desert canyon stream and great views of Pusch Ridge and the Santa Catalinas await you along this popular trail. The hike starts in Catalina State Park and uses scenic Romero Canyon as an access route into the Pusch Ridge Wilderness. Even along its early stretches, this trail offers good views of the Santa Catalina Mountains and of Cathedral Rock towering over the pinnacles of Pusch Ridge as well as sweeping views of the city. The climb toward Romero Pass includes several sections of steep switchbacks, some of which are rocky and rutted. In places, the trail is marked with cairns to distinguish it from the maze of opportunistic pathways that branch off to random destinations. As you make your way toward the pass, however, broad vistas continue to increase in drama and occasional sightings of desert bighorn sheep add an extra element of excitement to an already rewarding hike. At Romero Pass you have a number of trails to choose from. Connecting trails provide routes to the summit of Mt. Lemmon, to the Wilderness of Rock area, and to the scenic Sabino Basin and Sabino Canyon area to the south and east. Cathedral Rock Trail #26, a rugged and difficult route, provides access from Romero Pass to all the Front Range trails.